Our technical writers are expert users of many of the technical authoring packages. Let them advise and help you. We have huge expertise in technical authoring software. We are certified experts in many of these. We can assist you in getting the results you need. 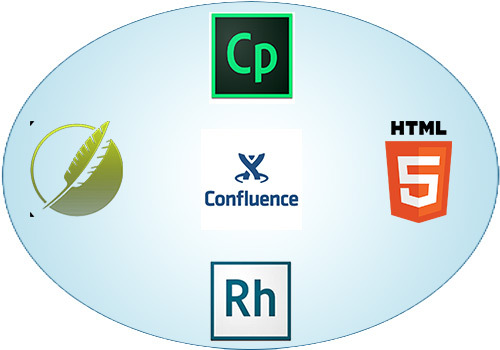 Whether it be choosing the right technical authoring software or template design, we can help. If you have technical issues to solve, we can assist. If you want to adapt your content or for mobile and tablet devices, we have expertise you can use. Our technical authoring software expertise can help you. Help we can give with your technical authoring software? Our consultants develop templates that match your branding. Our bright and modern designs enhance your software. Our templates also make navigation easy. The tri-pane system has a graphical table of contents, an index and search facility. Other designs include a top navigation bar and a welcome page slider. Using the principles of web site design, we develop online help templates that users love and that improve readability. We can make your online help 'responsive'. This means that it adjusts to the type of device that you're using. If your users display content on tablets or mobile phones, our templates adjust layout and appearance to suit the device. If your technical authors are having problems with their technical authoring software, we can help. We can resolve technical issues with your projects and develop a solution to a special effect you want to create. We have programming skills in cascading stylesheets. We can make your online help look good and match your branding. We can also help you work better by improving your .css. Use our experts to improve what you do. If you want more information on what we can do for you then please get in touch.